Nordic Seafood was founded in 1988 in the Danish fishing port of Hirtshals. Nordic Seafood’s owner is one of the world’s leader in fishing and fish processing: Nippon Suisan Ltd. (NISSUI) in Japan. As importer and distributor, Nordic Seafood creates seafood value for our customers by staying ahead in terms of quality, dependability of deliveries and price. 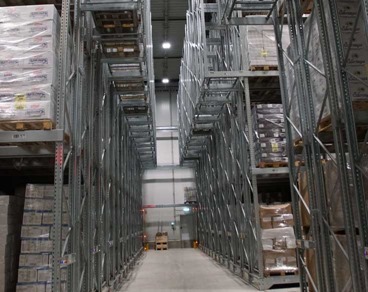 Our premises in Hirtshals include 2,300 m2 of production facilities and 6,000 m2 of cold stores. Every single day fresh and frozen fish and shellfish arrives from all over the world at Nordic Seafood’s modern production facilities in Hirtshals. Nordic Seafood carries a stock ranging across more than 1,000 varieties of products and our close contact with NISSUI ensure full vertical integration in quality control and product flow from catch to the customer. In the vertical production process, safety along the whole line from catch to delivery is ensured by Nordic Seafood’s own control measures. Our quality control department checks the in-coming supplies as well as our own production before distributing products throughout Europe. Marine Stewardship Council (MSC) and Aquaculture Stewardship Council (ASC) are international non-profit organizations created to promote solutions to the problem of overfishing and responsible aquaculture. The MSC runs the only internationally recognized environmental certification and eco-labelling program for sustainability in wild capture fisheries. More than 400 processors, factories and seafood companies meet the MSC's traceability standard, the Chain of Custody, which ensures the blue MSC label is only placed on fish that comes from a certified fishery. The ASC has developed a certification program for responsible aquaculture and works with international producers and companies in the fish chain. The green ASC label makes it easy for the consumers that they are buying responsibly farmed seafood - fish, crustaceans and shellfish - towards environmental sustainability. 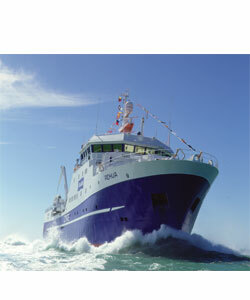 Nordic Seafood is one of Europe’s leading distributor of top-quality fish and shellfish from the whole World. "If it’s in the sea, it’s on our list"
With our own sales companies and permanent business partners on all European markets, we at Nordic Seafood are close to our customers and their needs. Not merely as dependable and competitive supplier, but also as a flexible and development-orientated partner. Fish and shellfish are healthy foodstuffs with endless gastronomic possibilities. Through our global network of suppliers, Nordic Seafood keeps up-to-date with the latest trends and possible applications.This knowledge benefits our customers whilst, at the same time, ensuring that we can meet individual wishes in such things as package dimensions, form of packaging and type of processing. This close communication with our customers exists on the personal level but also through Nordic Seafood’s participation in the leading trade fairs and exhibitions. Our production methods can also satisfy special customer wishes about such things as the degree of processing and package size. In the vertical production process, safety along the whole line from catch to delivery is ensured by Nordic Seafood’s own control measures. Our laboratory checks the incoming supplies as well as our own production before distributing products throughout Europe, by means of an efficient and professional system of logistics. 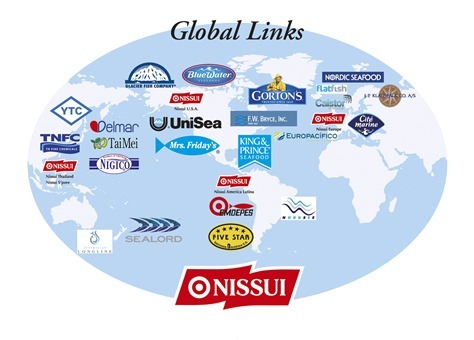 NISSUI has established a "Global Link" as the largest global supply chain for seafood. Nordic Seafood hold leading positions in the network together with a number of other major companies throughout the world. The aim is that within a few years, GL will not just stand for Global Link but also Global Leader. Global Link is an expression of a wish to combine the wealth of the oceans with scientific development and human values in a responsible utilization of resources for the benefit of the people of the world and with respect for future generations. The thoughts behind Global Link are in harmony with Nordic Seafood’s long-standing basic values: the distribution of top-quality products based on ethical principles. This involves respect for the environment and reliability in cooperation with customers. IFS Food Standard vers. 6, April 2014. HIGHER LEVEL. 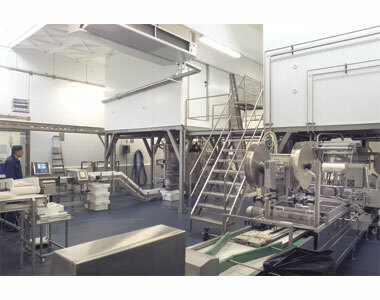 Cutting of frozen fish fillets into portions, glazing of frozen Seafood Products, re-packing of frozen seafood products and freezing of chilled seafood packed in plastic foil and/or cardboard boxes with or without vacuum and with or without MAP packing. IFS Broker vers. 2, October 2013. HIGHER LEVEL. Standard for audition trade agencies, importers and brokers. meat, egg, and dairy products.